My father, Lewis Case, died in February, one day after his 101st birthday. He lived a very long, very full and very good life. 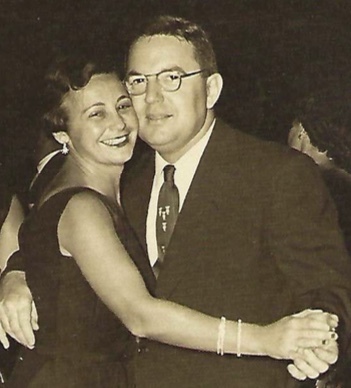 He was a model of devotion to my mother – they were married for almost 72 years when she died four years ago. He was a very supportive father to my brother and me, and to our wives. Nothing made him happier than being with or hearing about his four grandchildren and their spouses and children. My father was the child of immigrants – his mother and father came from eastern Europe as teenagers, and his mother, my grandmother, read and wrote in Yiddish, not English. My father was a model of the American Dream – he went to veterinary school, served in the Army Veterinary Corps in China and India during World War II, and became a successful professional, the president of the Connecticut Veterinary Medical Association. My father was a model of what immigrants can do for our country. Jews of my generation remember their grandparents and have some connection to what being immigrants means; my children and people in their generation are so Americanized they don’t have that experience. At my father’s high school in Hartford, there were many Italians, Poles, and Irish, but all of my father’s friends were Jews. The idea of marrying someone not Jewish was probably inconceivable to him or my mother; between 1940 and 1960, only 6% of Jews intermarried. Because veterinarians in those days didn’t compete with each other and there was already a veterinarian in West Hartford where most of the Jews were moving, we lived in Wethersfield, where there were very few Jews. While my parents continued to socialize almost exclusively with their Jewish friends, and while I went to Hebrew school in West Hartford, hardly any of the friends I saw every day in school were Jewish. It’s a well-known phenomenon that successive generations of immigrants tend to branch out from their own ethnic group, and that happened in my family – much to the chagrin of my father. He was extremely disappointed that I would chose to love someone of a different faith, and Wendy and I had a tortured six-year courtship because our relationship was interfaith. But my father was also a model of how a parent can chose both to love his child and to see his tradition maintained. When Wendy and I decided to marry, my father and mother decided they were not going to lose me, and he did not intrude or ever say “you should” about anything related to religion. Instead, in what I would call an early instance of a radically inclusive attitude, he chose to love Wendy as his own daughter. His welcoming embrace enabled Wendy and I to create a Jewish family, and our children in turn to do the same. And the last thing Wendy said to him was that he would always be in her heart, just like her own parents are. I am extraordinarily fortunate to have had my father in my life. May his memory always be for a blessing. This is so beautifully written it brings tears to my eyes. God Bless! Thank you for sharing your beautiful story. God Bless you and yours!